Evidence shows ocean sound may help reduce stress and create a sense of calm. The power of the ocean to bring mental health benefits to humans is a growing field of research as scientists increasingly understand the value of the marine realm in human health and wellbeing. Being near to or hearing the ocean is recognised as bringing a sense of calm and perspective and a new project aims to give people access to this benefit wherever they are. A ‘digital seashell’ of wave sound is being launched for Mental Health Awareness week (14 – 20 May), to remind doctors, teachers and mental health professionals of the ocean’s restorative power – and encourage them to include time by, or listening to, the ocean in their list of self-care recommendations. Organised by the Marine CoLABoration, a group of organisations working to protect the ocean and reconnect people with its importance in all our lives, the ‘Sound Waves’ project builds on a growing body of research into the role of blue space. 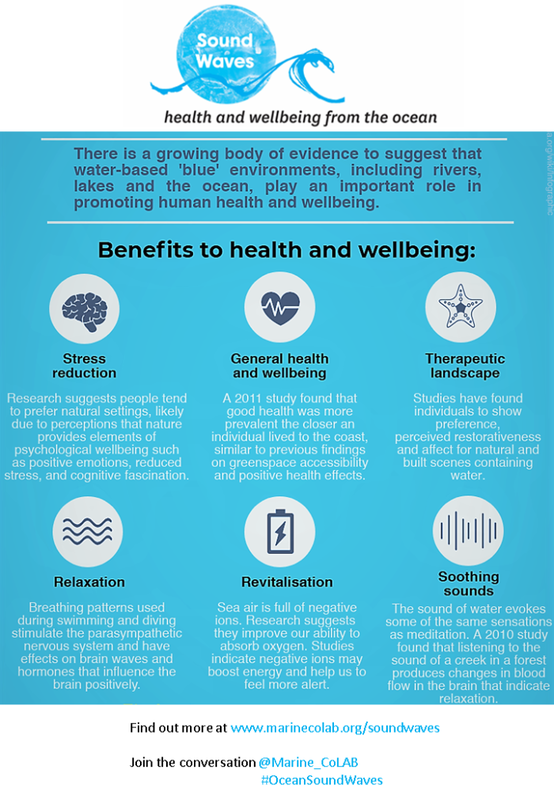 The BlueHealth programme (bluehealth2020.eu) led by the University of Exeter, for example, is dedicated to better understanding the link between water and human health and is uncovering the extraordinary role that blue space can play in human wellbeing. Published research found that both natural and built environments containing water were associated with higher preferences, greater positive affect and higher perceived restorativeness than those without water.